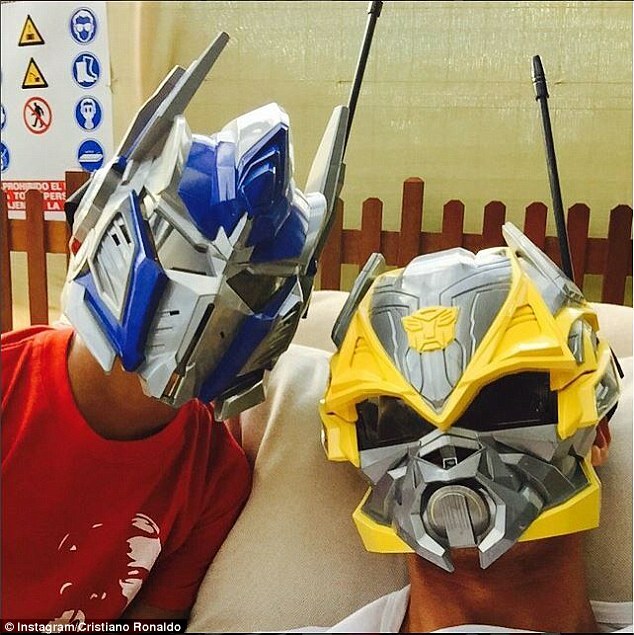 It looks like Cristiano Ronaldo’s young son is certainly following in his famous father's footsteps. The frowning Portugese forward, who is no stranger to sharing snaps of him and his youngster, posted a picture of himself showing off his washboard abs dressed in just a towel as he flexes his muscles. While his son - also Cristiano - can be seen standing next to him pulling a similar pose. "Like Dad like Son," the Real Madrid star wrote next to it. Play as a child with CRJ. Proving just how much of an A list life he leads, he also posted a shot of the pair of them getting into a gleaming white Ferrari in the grounds of his million pound pad. Although proving he's still young at heart, he also posted a picture of them wearing Tranformers masks, which was captioned: "Play as a child with CRJ." In the past, the star has shared pictures of them training together and even got the five-year-old to do sit-ups.